A standoff between President Donald Trump and Democratic congressional leaders over how to address unauthorized immigration at the U.S.-Mexico border has led to a partial shutdown of the federal government – one that soon could become the longest on record. The United States was home to 10.7 million unauthorized immigrants in 2016, a 13% decline from a peak of 12.2 million in 2007, according to the most recent Pew Research Center estimates. This decade-long decline was driven almost entirely by a decrease in unauthorized immigrants from Mexico, even as the numbers from El Salvador, Guatemala and Honduras increased. Meanwhile, a growing share of unauthorized immigrants were not people who had entered the country illegally, but had arrived legally and then overstayed their visas. More recent data from the federal government show that 2018 saw an uptick in border apprehensions (which are often used as a proxy measure for unlawful entries). There were nearly 416,000 apprehensions at the Southwest border between January and November last year, the most in any January-November period since 2014. Still, the number of apprehensions in 2018 remained far below the more than 1 million apprehensions per year routinely recorded during the 1980s, 1990s and 2000s. 1The vast majority of immigrants in the U.S. are in the country legally – but fewer than half of Americans know that’s the case. Lawful immigrants accounted for about three-quarters (76%) of all immigrants in the U.S. in 2016. But in a survey conducted in June 2018, only 45% of Americans correctly said most immigrants are in the country legally. Around a third of U.S. adults (35%) incorrectly said that most immigrants are in the country illegally, while 6% said about half of all immigrants are here illegally and half legally. Another 13% did not provide a response. 2Republican and Democratic voters sharply disagree over whether illegal immigration is a major problem in the U.S. today. In a survey conducted ahead of last year’s midterm elections, three-quarters of registered voters who planned to support the GOP candidate in their congressional district said illegal immigration was a very big problem in the country, versus just 19% among voters who planned to support their Democratic candidate for Congress. 3A majority of Americans (56%) oppose substantially expanding the wall along the U.S.-Mexico border – as Trump has sought – while 40% support doing so, according to a June 2018 survey by the Center. Attitudes diverge sharply by party: Nearly three-quarters of Republicans and Republican-leaning independents (74%) support expanding the wall, while an even larger share of Democrats and Democratic leaners (83%) oppose it. 4Proximity to the Mexican border is a factor in Republicans’ views of a border wall. Republicans overwhelmingly favor building a wall along the entire border, but Republicans who live closer to the border are somewhat less likely to favor it, according to an analysis by the Center based on February 2017 survey data. The analysis found that 63% of Republicans who live within 350 miles of the border favor a wall along the entire border, compared with 74% of Republicans overall. Among Democrats, opposition to a wall is overwhelming regardless of their distance from the border. 5Disagreement between partisans extends to the effects of a wall. Around six-in-ten Republicans (58%) said in the February 2017 survey that a wall along the entire U.S. border with Mexico would lead to a major reduction in illegal immigration into the country. An even larger share of Democrats (65%) said it would not have much impact. 6 Long before the shutdown began, most Democrats – and nearly half of Republicans – said the U.S. would ultimately pay for a wall. Nearly nine-in-ten Democrats (87%) said in February 2017that the U.S. would end up paying for a wall along the entire U.S. border with Mexico – a view shared by 46% of Republicans. Overall, seven-in-ten U.S. adults said the U.S. would ultimately pay for a wall, while just 16% said Mexico would pay for it. 7Most Americans favor granting permanent legal status to immigrants who came to the U.S. illegally as children. Nearly three-quarters of Americans (73%), including 89% of Democrats and 54% of Republicans, said in June 2018 that they favor such permanent legal status. Recent news reports have indicated that a discussion over legal status for such children may be part of broader negotiations over the federal government shutdown. 8Americans are more inclined to prefer politicians who stick to their positions than those who make compromises with people they disagree with (53% vs. 44%), according to a March 2018 survey. This marked a reversal from July 2017, when nearly six-in-ten Americans (58%) said they preferred politicians who compromised and 39% said they preferred politicians who stick to their positions. In the 2018 survey, there was no difference between Republicans and Democrats in views of compromise. That was a change from the sentiment found in six prior surveys since 2011, in which Democrats were more likely than Republicans to favor politicians who compromised. 9 Whatever else they think of him,about two-thirds of Americans (68%) – including around half of Democrats – say Trump stands up for what he believes in, according to a September 2018 survey. Around nine-in-ten Republicans (91%) say Trump stands up for his beliefs, as do 52% of Democrats – a far higher share of Democrats than give the president positive marks on other personal qualities, such as being a strong leader, being well-informed and being trustworthy. 10Most Americans hoped for efforts at cooperation between Trump and Democratic leaders in the current Congress, according to a post-election survey conducted in November. 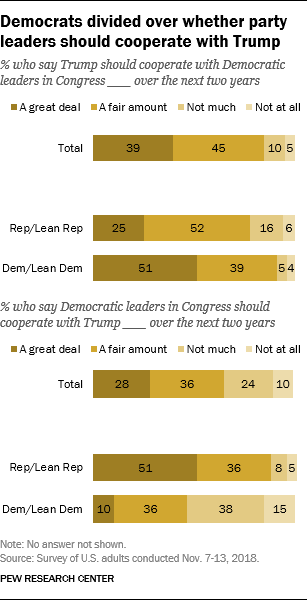 More than eight-in-ten U.S. adults (84%) said Trump should cooperate either a great deal (39%) or a fair amount (45%) with Democratic leaders over the next two years. A smaller majority (65%), however, said Democratic leaders should cooperate with Trump a great deal (28%) or a fair amount (36%).